On Wednesday night the Chief Justice launched the book of essays written in honour of Sir Kenneth Keith, edited by Claudia Geringer and me: Claudia Geiringer and Dean R Knight (eds) Seeing the World Whole: Essays in Honour of Sir Kenneth Keith (Victoria University Press, Wellington, 2008). The title of this collection — Seeing the World Whole — is appropriated (with thanks) from Ben Keith’s essay for the collection: "Seeing the World Whole: Understanding the Citation of External Sources in Judicial Reasoning". Ben Keith draws the title from Sir Kenneth’s extra-judicial writings in which Sir Kenneth drew on Richard Maclaurin who, in turn, drew on Matthew Arnold’s poem, "To a Friend": "who saw life steadily and saw it whole". It is apt that Ben Keith should have derived his title from a series of successive borrowings as the theme of his essay is borrowing of a sort — by judges, from external sources (that is, sources external to the legal resources of the particular legal system), in order to support the judicial reasoning process. It is doubly apt because Sir Kenneth, as Ben Keith points out, has been a consistent advocate of "a wide and flexible approach to legal method" and, as a judge himself, has drawn freely on a wide range of sources in his decisions. The use of external sources in judicial reasoning is, however, only one of the many ways in which Sir Kenneth has encouraged those of us engaged in the enterprise of law in its many manifestations to "see the world whole". As the contributors to this collection note time and time again, if there is one distinguishing feature of Sir Kenneth’s contribution to the law it is his ability to see connections and to encourage others to do likewise. Thus, for example, the Chief Justice remarks in her Opening Address that, "one of the gifts Sir Kenneth has is to see connections where others see divisions." This ability to see connections is also captured in Bill Sewell’s poem, "The Net-Maker", written for Sir Kenneth in 1996 — the year he took up judicial appointment on the Court of Appeal — and included in this collection with the permission of his wife, Amanda Powell. The unifying theme to this collection, therefore, is the interconnectivity of the enterprise of law. The essays contained in it reflect Sir Kenneth’s preoccupation with the connections that underlie the legal universe — between the local and the international, the past and the present, the practical and the theoretical; between law and policy, law and history, law and literature; between the varying sources that underlie the law and legal reasoning, and between the varying professional roles that may constitute a legal career. 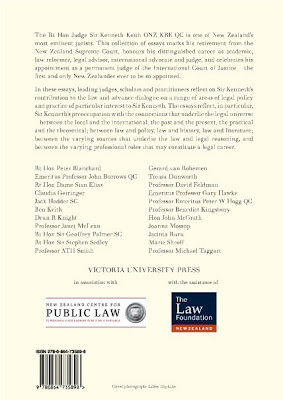 The essays in this collection were initially prepared for the conference, "From Professing to Advising to Judging: A Conference in Honour of Sir Kenneth Keith", held at the Victoria University of Wellington in August 2007. Jointly organised by the Faculty of Law and the New Zealand Centre for Public Law, the conference marked Sir Kenneth’s retirement from the New Zealand judiciary, celebrated his ascension to the giddy heights of the International Court of Justice and honoured his distinguished career as academic, law reformer, legal advisor, international advocate and judge. The back cover, with the list of contributors, is below. The book can be purchased from good book stores for $60. 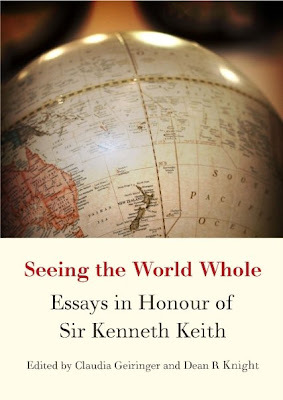 Or $54 from the following Vic sites: > VicBooks: "Seeing the World Whole: Essays in Honour of Sir Kenneth Keith" > VUP: "Seeing the World Whole: Essays in Honour of Sir Kenneth Keith"